The Dutch are not particularly known for their culinary delights. 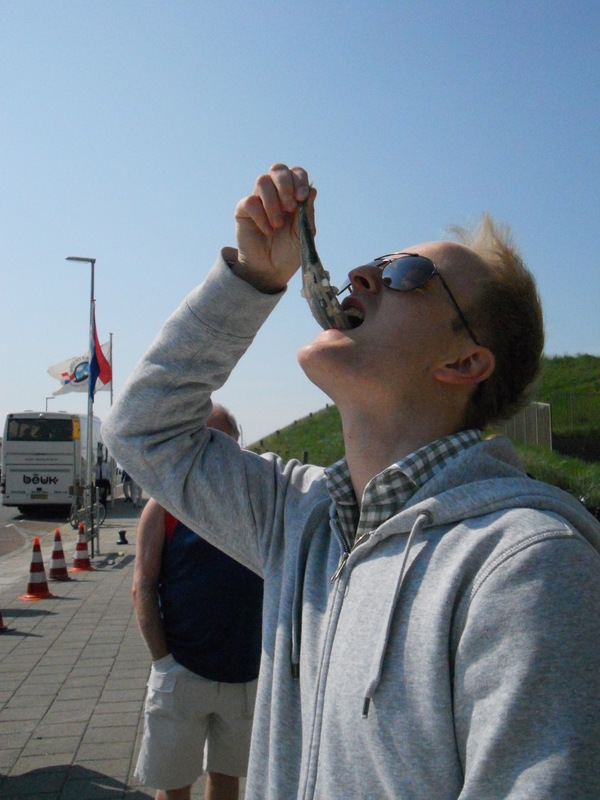 There is one delicacy, however, that every visitor to the Netherlands must try: Dutch herring. This raw, silvery little fish is something that is enjoyed by almost every Dutchman. Actually, enjoy is not a strong enough word to describe the Dutch love of herring. Dutch people would probably trade their first-born child for a couple of these slimy buggers. Where we have taco trucks and hot dog stands in the U.S., the Dutch fill every street corner with designated herring stands. The Dutch passion for haring is a long-standing one. Herring, fished from the North Sea, has been a valuable commodity in the Netherlands for hundreds of years. There is a Dutch saying that “Amsterdam was built on herring bones,” meaning that profits from the lucrative herring trade financed many of the beautiful buildings that line Amsterdam’s canals. Today, the Dutch empire may be lacking but the demand for herring continues unabated. Every year in June, the seaside town of Scheveningen (try saying that five times fast) celebrates Vlaggetjesdag (“Flag Day”). 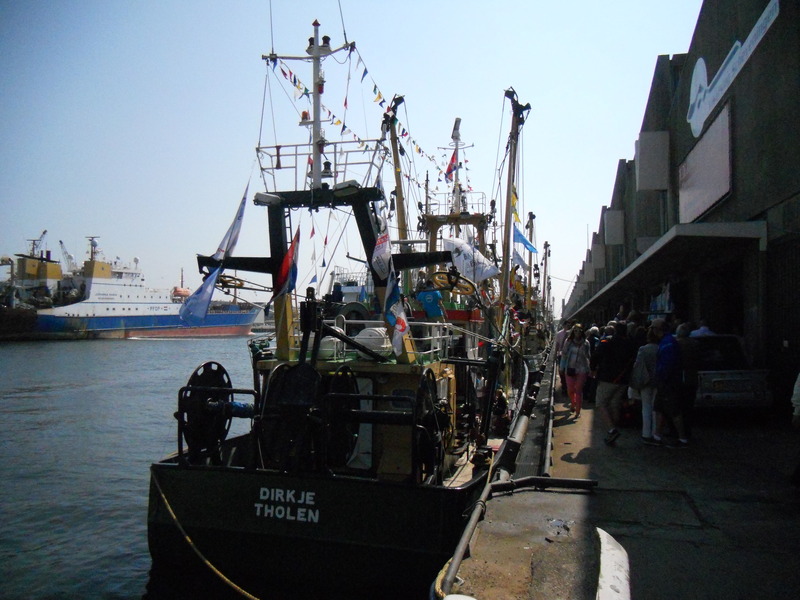 On Vlaggetjesdag, the fishing boats (grandly decorated with flags and pennants–hence the name “flag day”) sail back into the harbors of the Netherlands with the first catch of Hollandse nieuwe herring of the year. The captain of the first ship that reaches port was traditionally given the honor of bringing a crate of herring to the Queen. Today, the first barrel of herring off the boat is auctioned off for charity. In 2012, the first herring barrel sold for a record price of 95,000 Euros! Yum. I know I love to eat my fish with pancreas intact. This year’s Vlaggetjesdag provided a great excuse for me and Willem to get out of the house, and for me to learn a little more about this Dutchiest of Dutch delicacies. I was pleasantly surprised at how much there was to see and do. We were able to tour fishing boats and ships of the Dutch Royal Navy, see how traditional nautical handicrafts were made, and of course eat herring. Willem, the good Dutchman that he is, downed three of them in the span of about five minutes. I chose not to partake this time, as I have already had the honor of tasting herring. Let’s just say, it was not my favorite food. Supposedly herring is an acquired taste. After my experience with herring though, I don’t really want to acquire it. 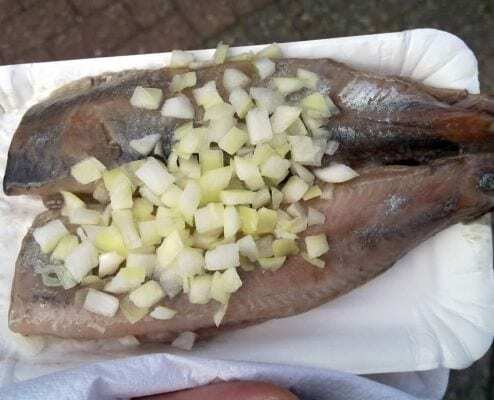 Should you choose to try a herring when you visit the Netherlands (to anyone who visits us in Haarlem- there is a herring stand 50 meters from our front door, so prepare yourselves! ), you cannot just eat it any-which-way. The correct way to eat a herring is to 1) pick it up by the tail; 2) dip the herring in raw, diced onions; and 3) tip your head back and throw that slimy thing down the hatch! This entry was posted in Netherlands, Scheveningen and tagged Dutch culture, Dutch Food, Dutch Traditions, Expat life, Herring, Scheveningen, Vlaggetjesdag by astateofwanderlust. Bookmark the permalink.